Every game, they dig the hole a little deeper. Every week, they move a little more dirt. Every week, they show up with a shovel. Every performance, they work their way toward the center of the earth. They seem dedicated to the excavation, as if it was their primary goal. After all of this time, darned if it doesn't look as if the Tampa Bay Bucs are digging themselves a grave. Every week, it is the same. The Bucs are so lousy early that the final result is predictable. They get off to awful beginnings, and it makes for disappointing endings. They cannot run the ball, and they cannot tackle, and they cannot cover. All they can do, it seems, is lose. The Bucs season got even worse Sunday when they absorbed a 42-28 beating at the hands of the Carolina Panthers. Tampa Bay fell behind 35-7 (and what else is new?) on their way to defeat. By now, this shouldn't surprise anyone. The Bucs have held the halftime lead in three games this season, and those are the three they won. But in their other games, they were walloped coming onto the field. Think of the halftime scores. Pittsburgh 30, Tampa Bay 10. Chicago 38, Tampa Bay 3. Atlanta 24, Tampa Bay 13. Cincinnati 27, Tampa Bay 9. And Carolina 35, Tampa Bay 7. Tell me: What would anyone's record be with first halves such as those? It's a dreadful script to follow, and it gives a team almost no chance to win Maybe that's why the Bucs have lost six of their last seven games. In particular Sunday, the Bucs tackled so poorly you might think they were playing two-hand touch. "We’re in this pattern of we go out and get behind," Bucs' coach Dirk Koetter said. "We get killed in the second quarter, then we rally like hell in the third quarter. Then everybody thinks we're back in it, and we fade out at the end. That’s definitely the pattern we’re in. If I knew one thing to fix it, I’d do it right now. I don’t know what that is." Ryan Fitzpatrick as the starting quarterback. And he gave the team moments of Fitzmagic and moments of Fitztragic. He threw four touchdown passes, but he threw two interceptions, and one of those gift-wrapped a touchdown for Carolina. He wasn't as bad as Jameis Winston was the week before, but he wasn't as good as the Panthers' Cam Newton, either. Newton was the latest quarterback to embarrass the Bucs' secondary. He hit 19 of 25 for 247 yards and two scores, a rating of 133.2. Fitzpatrick wasn't great, but he wasn't the worst culprit in the loss. He played well enough that Koetter quickly said he would start in next week's game against Washington. 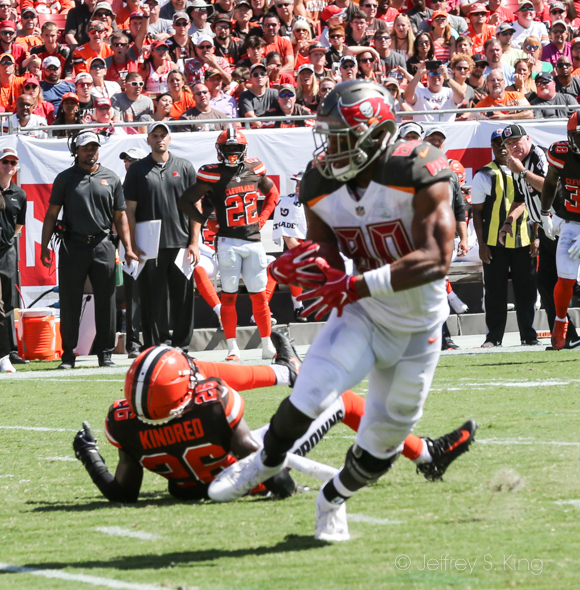 Around him, there was no running game (Peyton Barber gained just 31 yards on 11 carries) and his main receiver (Mike Evans was targeted 10 times, but he made just one catch) was draped. The Bucs even tried a fake punt -- unsuccessfully -- in the third period. "You're either going to look real smart or you're going to look dumb if it doesn't work, so that's on me," Koetter said. Frankly, what the Bucs looked was desperate. With no running game and no defense, what other look is possible? And while we're asking, who thought that last season's 5-11 record was a high mark? Then there was the defense, which wasn't very good. The Bucs gave up 400 or more yards for the eighth time in nine losses. Carolina runners kept weaving down the field, hurdling some tacklers, evading others, as they went to the end zone on five straight possessions. "Our tackling was very poor in the first half," Koetter said. "We just looked like a bad tackling football team in that first half." Right now, the Bucs are playing as bad as anyone. The Raiders? Check. The Giants? Yes. The Bills? You bet. For a team that fancies itself as being in a playoff race, the Bucs look like they're making a run at a top-five draft choice. So what play will define this game for you? Was it Carlton Davis, yapping after a rare successful defensive play? Was it Fitzpatrick's first interception? Was it the botched fake punt? Will you remember any of them in a season that has turned forgettable? The Bucs play the Washington Redskins, the leaders of the NFC East, next week at Raymond James Stadium. Kickoff is set for 1 p.m.
Well maybe the Bucs can beat the Giants! It seems like the Bucs season is done by Halloween the past few seasons! The Bucs defense is on track to break NFL records for points given up! Hey…that is something that Koetter can fix! Will 4 and 12 get them a top-5 pick Gary? 4-12 probably won’t get you in the top five. They were 5-11 last year. Where did they pick originally? Eighth? Oh I forgot the coach in my rant! Koetter admits he doesn’t know how to fix it! Being clueless is not good for anyone’s job resume! He should consider the rest of the year an audition for his next team! Sorry…..now I’m done. That game was really hard to watch! They can’t tackle anyone, cover anyone! They never intercept or cause fumbles (except their own). Boy was I glad when it was over. After my blood pressure settled I got to watch 2 really good games with real professional looking players! The second meeting with Brees will be a disaster at the level the Bucs are playing now! In fact I do not see 1 game on the remaining schedule that the Bucs might win! They will be underdogs the rest of the season. A top five draft pick looks doable though. Do you see them winning again?